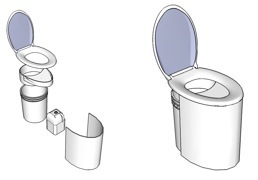 We’re designing an ultra-low-cost toilet around removable containers that make it easy to collect and transport wastes safely from the community. 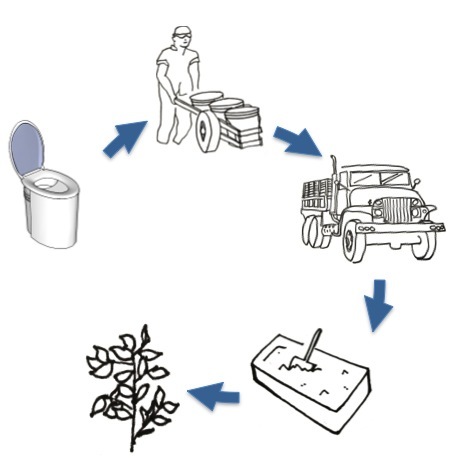 We know from many conversations with residents of Shada that a good toilet is a symbol of cleanliness and modernity. Beyond being odorless, hygienic, and vector-free, our toilet needs to be elegant, modern, and pleasant to use. And it needs to be cheap. To that end, our toilet combines a 20-L bucket, a liquid container, and a western-style toilet seat into a sealed, portable, urine-diverting toilet. Our first strategy for Haiti is to collect and deliver the wastes to SOIL’s existing compost sites, where the wastes will be converted to valuable compost for sale to agricultural and reforestation customers. Since Shada has limited road access and is too dense for on-site treatment, we are developing a two-step collection process. First, full containers are removed from the homes and replaced with clean ones. The containers are transported in carts or dollies from homes to collection centers, where they are then transferred to trucks for transport, processing, and cleaning at the compost site. We can then sell the compost to help finance the service, and help restore Haiti’s devastated soil. Our operations will enable us to try various different service models beyond the fee-for-approach that has traditionally dominated sanitation. Our toilet is portable, so our customers in Shada may ultimately subscribe to a toilet instead of buying one, assuring sustained service while avoiding the up-front expense that can be a large barrier to entry. Hi! Great site and interesting ideas you have! I do agree that household toilets may be better than communal/public ones but this might not be what the people want. I’m currently carrying out a MSc thesis research in a slum in Mumbai, India. People here prefer a toilet outside their homes because of cultural issues (in the villages they’re all outside the house). I’m not saying that it’s impossible to change that idea, but it will be difficult. Also, this concept relies on the assumption that there would be a demand for the compost. This might also prove to be a challenge, also because of cultural reasons. Anyway, best of luck and I’m eager to read more!! Hi Giacomo! Thanks for the comment. 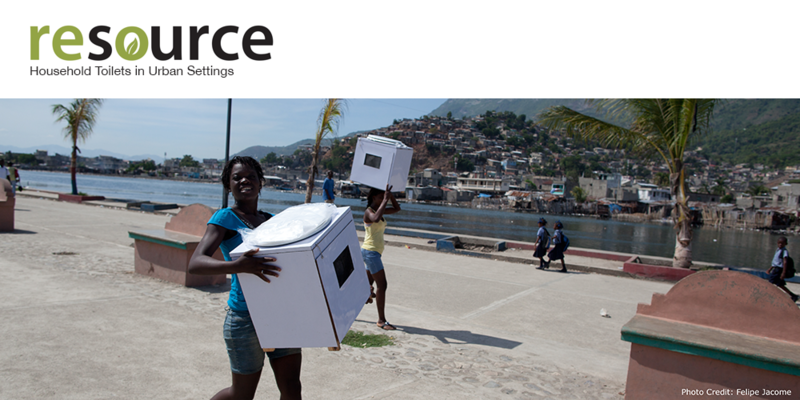 We agree that user preferences, aspirations, and demand are what will determine the success of any sanitation service. That said, in our experience, a private toilet is a (near) universal aspiration. Now how can we deliver on that? We bear in mind an adage we’ve heard many times: “Everyone wants to have a toilet where they live, but no one wants to live in a toilet”. A private toilet can (and should) be located and configured in an infinite number of ways to fit within cultural or personal preferences. And if one household doesn’t have the space or funds for their own toilet, they can always agree with their neighbors to subscribe to the service as a group. All we have to vary is the waste collection frequency and the pricing structure. Congratulations Sebastien and team for winning the Sustainable Silicon Valley Award! Great work and how beneficial too! Thanks for your support Marty! Great Idea!! Sanitation is one of the biggest problem in many developing countries. It is also a cause for many diseases. I also believe that we also need to train & inform the people about the health benefits of this service, how important it is not to pollute the places around us and how it will affect everyone living there, how much money are we saving by using this service – you can also include the medical expenditure as a cost benefit, if it is relevant. In this way I think many people may subscribe for this service. All the best to your team!! Keep up the good work. Congratulations! This will be a good service for Western homes that are off the sanitation grid. I would think a regular collection service would be more cost effective and environmentally much smarter than a septic tank. I’m looking forward to knowing more!